Let me tell you the number one secret of marketing online. Are there other secrets? I’ve probably told you quite a few top secrets but to be honest this is it. The money is in the list. Now some internet marketers, they will spout out that line, “the money is in the list”, as if the list is meaningless. But what I am trying to tell you is that the way to make money online, unless you are a direct ecommerce site like Amazon or like my fire safety company site online, is through having a list. The way to get people on this list is to get them to opt in to give their email address which will add that to an email service provider data base. Then you are going to nurture those people via email over a period of time to get them to know you, to get them to like you and to get them to trust you. And once they get past the trust place then they’re ready to buy and that is what it’s all about. The great thing is because you take a little longer developing that relationship. You develop a relationship, yes pretty cool. You’ve cemented a long term customer. They have spent, they’ve invested time in you, in getting to know you getting to like you and getting to trust you. It’s very very important. It is not this one hit wonder stuff. I’ve told you this one before, when someone comes to your website the first thing they need to see is some form of offer that asks them for their permission to market to them in exchange for something of value that they’re going to get for free. We call this a lead magnet. We have discussed this many times before about the different types of lead magnets that can be created very simply. This email list should never ever be kept on your own server or on your own computer. You should never use your own email service to email these people. It must be done through an email service provider. Some of the more popular ones are Aweber, mail chimp, infusionsoft, Convertkit, Icontact, and Constant Contact. We use Aweber here, in my main business, and then in another business we use mail chimp. We are quite experienced with a few. To be honest Aweber works just great. So then once you’ve established that you need to build a list and you need to be list building all the time. Your website has two purposes–I am going to assume that you are not a government. Not everyone is ready to buy today, so we’ve discussed this before and we’ll discuss it again. So once you capture those leads and bear in mind ecommerce sites are also capturing email addresses when you make a purchase and they have the option to add them to an email service provider. So how big does that list need to be? Of course the bigger the better surely. It’s not about the numbers. If you’re aiming for numbers and if you are just after the numbers, you’re really missing the point. You need to treat people as individuals. So if you have a list of 10,000 people — that is fantastic. I can show you people with lists of 200 people who can get more sales from it. And why is that? Because they put more effort into it by nurturing. Now they wouldn’t call it nurturing they would call it building a relationship. Well they get personal and what I mean by that is they allow people in to their lives, they allow people to truly get to know them. They will explain their life’s journey, how they came to be, how they came to this point, how they started their business, how they were supported, all their failings, what money was invested, what debts were run up, what successes have been had, people who’ve learned from them and succeeded too and what it’s meant for their lives. When they’ve had kids, when they’ve got married, moving to new house, being flooded by storms and having to renew things everything like that. Once you allow people in they feel like they are friends and this is the truth of an email. That’s where a lot of ecommerce companies go wrong, because they are so impersonal, because they have massive numbers and they just want to send out offers. People might buy after a couple of offers but after that they get bored, that’s it they delete. Whereas I know a guy, David Siteman Garland, and he has a business called Rise to the Top. His website is called risetothetop.com. He will talk often about smaller numbers of when he had a small list and he made a lot of money. If you sign up to his email list the guy is great. He is American so to a lot of us English he’s a little over the top but that’s just the way he is, he’s okay he’s genuine and people like that. I know others like Nikki Elledge Brown and Amy Porterfield. They have a way to make you feel like you know them. The other day I interviewed Chris Ducker, who is a great guy for an upcoming podcast and I’ve seen him on video, I’ve read his emails and as I said in the beginning, in the preamble that I actually feel like he’s my mate. I feel like I know him and he feels like I a mate of mine. I said sorry if I come across as too informal at times because I feel like I know you. And he said thank you very much that’s a very kind compliment and I wasn’t complimenting I was telling it like it is but that’s what I was trying to do. That’s the way. 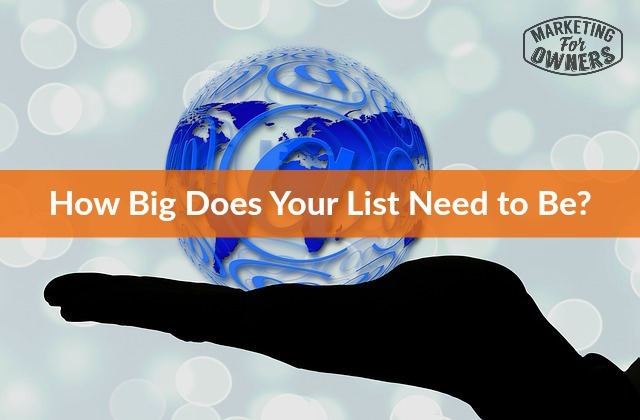 So your list size does not matter. What does matter, and I want to stress this, is that you start building a list today not yesterday, but start today. We’ll talk about lists again. So today’s book for the week is by my friend John Jantsch. I think this is probably going to be his third book on the list. Remember we interviewed him a couple of weeks ago. He is a brilliant guy. I really look up to him and really admire what he does. 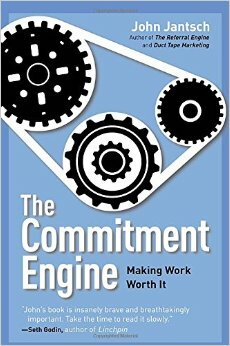 But his book is called The Commitment Engine and on the description it says ‘making work worth it’. And that is it, it’s actually the only book I’ve seen written on the subject. More about the structure and everything else and getting your staff involved. It’s wonderful. It’s about how to get people to commit to your business, it’s such a darn good book. Now if you would like a free copy of that book or if you would like a free copy of any other 60 books that we’ve recommended over the last year or more then please just go to marketingforowners.com/freebook and go see what you have to do to get one. It doesn’t take much. You’ll get a brand new one from Amazon shipped to you at our expense anywhere in the world, anywhere. Try it. It’s going to be good. I’ll see you tomorrow.